The Casper USB recorder will record all conversations on a single phone line to a computer. Conversations on any phone on that line will be recorded. In a multi-line setup, you need one Casper unit per line. The Casper is designed to work in call center or office environments and can be installed directly on the analog lines that go into the phone system. This means you don't have to have a unit at every phone. All calls are recorded onto a single computer. The Casper comes with the necessary software that allows you to search through, play back and otherwise administer all of the recordings made. No batteries or power adapters are required, making the Casper's operation reliable and maintenance free. This is a low-cost, effective option for call recording you should definitely consider if you're in the market for digital recording of phone conversations. 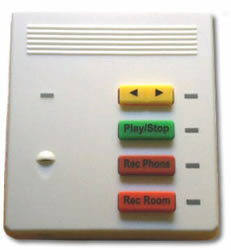 USB Phone Line Recorder "Casper"
Works with all corded and cordless phones. Built in Microphone for recording room or meeting conversations. Archive or save recorded files to any network drive, PC, CD or FTP Site. Software allows instant playback of a call through speakers. Automatically time & date stamps recorded files. Add notes and bookmarks to recorded files. 2 Minute install, easy to use and very efficient. USB Recorder is the solution if recording from one line or 10,000 lines. Send recording as an email attachment. No tapes, No batteries. This is a maintenance free recorder. Built in microphone for room recording. Learn, change, and improve by listening to your recordings. Record manually or automatically when a call is made or a call comes in. 2000 minutes, without compression, of recording equal 1 gig on the hard drive. For home or office recording Records both sides of the conversation. Record conference calls with ease. Get a Quote on all Surge Suppression and UPS Equipment!